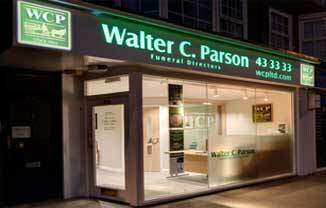 Ivybridge Funeral Directors Walter C. Parson are a family business established in 1842. It has, either by inheritance or acquisition, remained in the family over seven generations. Situated at the end of Costly Street, and beside the town hall, this office was opened in 1989 to serve the people of Ivybridge and the wider South Devon area. Our resident Funeral Director Shona Kearns is always on hand to help and guide you through required procedures. Our Ivybridge office serves Ivybridge, South Brent, Kingsbridge and the surrounding areas. "Thank you so much for your kindness and helpfulness"
Feedback: "I am very grateful for all the kindness and consideration shown by you and your staff"